Kudzu is in the Fabaceae (or Leguminosae) family. It was introduced into the U.S. from Asia in the late 1800’s for erosion control and as a livestock forage; the U.S. government supposedly paid farmers to plant kudzu as a ground cover and as a forage crop. This plant spreads by rhizomes and stolons. Due to its fast growth rate of 30cm (1’) per day it is also called the “mile a minute vine” and “the vine that ate the South” referring to the southern U.S. The bare vines are used for craft projects and basket making. Distinguishing Features: Kudzu is a deciduous yellow-green to gray woody vine that may reach a thickness of 25cm (10”) in diameter. 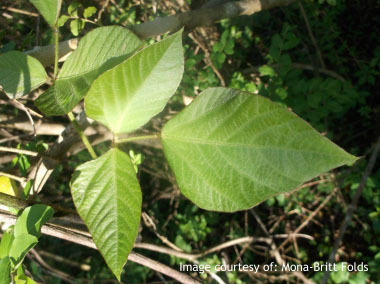 The long, bristly vines have large leaves that can grow up to 15 cm (6”) long. These vines drop their leaves in the winter months. 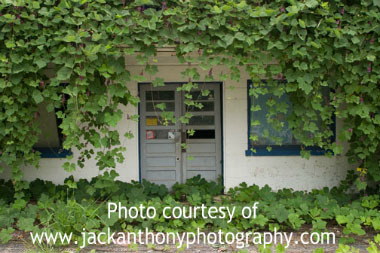 Abandoned buildings, cars, and other items are quickly covered by this fast growing vine. Flowers: The vine produces a long stem (15cm or 6”) of reddish –purple flowers. There is a spot of yellow on each stem of flowers. Each flower is on a separate petiole. Kudzu blossoms grow upright. As the petals emerge higher up on the flower stem the seed pods form at the bottom of the flower. Blossom time June-September. Fields of Nutrition has medicinal benefits and vitamin/mineral content of Kudzu. 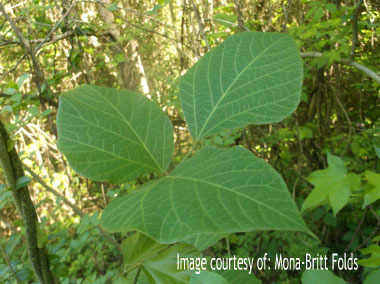 Leaves: Kudzu leaves are alternate and pinnately compound, with three leaflets. They are slightly longer than they are wide and can get to 15cm (6”) in length. 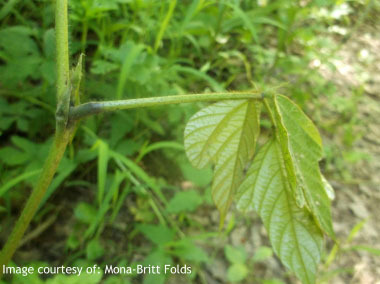 Leaves are generally dark green but some can be lighter. Height: This plant is a vine so it is not measured in height; it is measured by length. It can reach anywhere from 10 to 30 metres (35 to 100’) in length. Habitat: Kudzu coils and climbs anything in its path. It grows along field edges, in open fields, forest edges, roadsides, and near riparian areas. Kudzu prefers deep well-drained loamy soils; rough, well drained eroded land; disturbed, sandy deep loam soils. It prefers sunny locations primarily in the southern, eastern, and central US. It also grows in Washington, Oregon and is in southwestern Ontario. 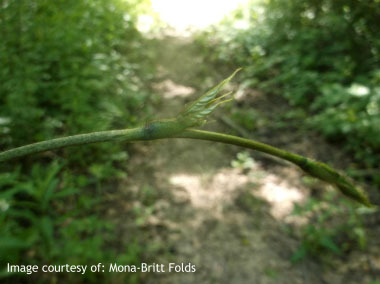 Edible parts: Kudzu leaves, flowers, blossoms, vine tips and roots are edible. 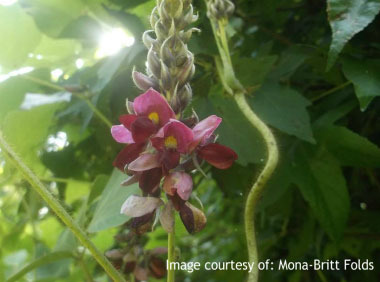 The kudzu plant produces fragrant blossoms which you can make into jelly, syrup and candy. Cook the root - it contains about 10% starch which can be extracted and used as a coating in deep fried foods, or for thickening soups etc. This plant is a staple food in Japan. 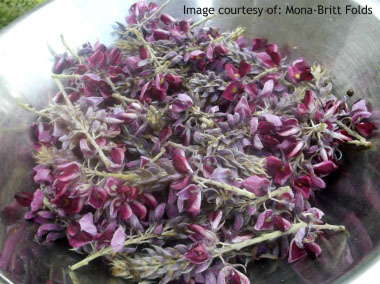 Flowers can be tossed on a salad, cooked or pickled. Stems and young leaves can be consumed raw or cooked.